Dr. Mildred García, who has led California State University Fullerton for the past five years, is leaving her post to become president of the American Association of State Colleges and Universities, or AASCU, making her the first Latina in higher education to hold that position. Dr. Mildred García, president of California State University, Fullerton, is leaving to become president of American Association of State Colleges and Universities. García, who was a first-generation college student, hopes to place an emphasis on diversity and inclusion to her new role. She said that her presidency will begin in January with a listening tour where she will visit with various board members and presidents from AASCU’s 400 member institutions. García will leave behind a legacy of raising graduation rates by 65 percent for first-time freshmen at Cal State Fullerton. Fundraising has also seen dramatic successes during her tenure at Fullerton, where annual commitments have gone from $8.5 million to $22 million. She said she will dearly miss the community at the California university. 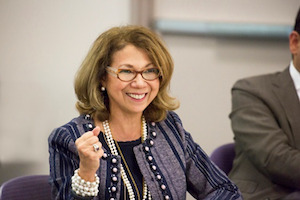 García, herself, has experience across higher education. She studied at New York City Community College and completed her undergraduate degree in business education at Baruch College. She went on to earn graduate degrees in Higher Education from New York University and Columbia University. She has been president at California State University Dominguez Hills and the CEO of Berkeley College. García said that although she will miss working with the diverse student body and the faculty at Fullerton, she ultimately decided to assume the presidency at AASCU to expand the reach of her work.